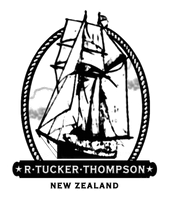 Ahoy from the good ship R Tucker Thompson. Today has been a hard earning and stamina building day with blue skies and lots of sun. Our day started off at 0715 with a morning wakeup swim in the brisk ocean lead by Skye, Julian and Connor, shortly after everyone plunged themselves into the water we went straight into morning duties. Scrubbing the decks, polishing the brass, cleaning the head and many more “FUN” duties. A breakfast of spaghetti, porridge and fruit salad was devoured by everyone then we went straight into sandwich making for our big hike. 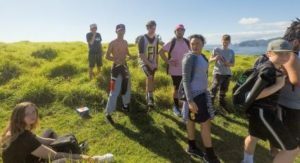 Once we packed our sandwiches, fruit, and chocolate fish and filled up our bottles we headed into Paradise bay to start our adventurous walk around Urupukapuka island. During the walk we stopped and did a short bio security lesson by weeding a section of bush to stop the spread of invasive weeds. Shortly after we carried our hike towards the cliff tops, Along the way we ran into many species of birds including the saddleback, fantail, kakariki and many other unique sounding species. After a hard but good hour and a half of hiking we stopped at a beautiful hill top view where we had a scrumcious lunch of sandwiches made by Milly and Mya. During this time we did our 30 minutes of silence and had time to reflect on ourselves and admire the views. After our lunches went down we carried on with our walk back towards the ship and made the decision to move the ship to another bay for the night. As soon as everyone was back on board we raised anchor and motored our way towards Oke Bay. Along our travels we ran into some dolphins!! They played around the ship and showed off to everyone on board for about 10 mi nutes. Right now we our steaming towards our night anchorage. The trainees have planned to go for a swim and have a bombing contest once we arrive. Another awesome day. Well done team. Kia ora Julian – awesome to hear you are leading the way in those early morning swims!! Very brave! Weather looks beautiful and sunny, even though it’s winter – and more dolphins!! Sounds amazing … really happy for you all.